Hibs recorded one of the finest results in their history thanks to a solitary Joe Harper strike against English giants Liverpool in the UEFA Cup, but it was a game where they should have won by more. The Hibees were dominant against their illustrious opponents in front of a packed Easter Road but would rue a late penalty miss by John Brownlie, as Liverpool went on to win the second leg 3-1 at Anfield and eventually ended the campaign as winners with a 4-3 triumph over Club Brugge. The hosts battered Liverpool for long spells of the second half after they went into the interval a goal ahead, with the visitors’ usually composed back line looking ragged. Hibs took charge of the tie early on as they pegged Liverpool back, with Pat Stanton’s through balls causing trouble for the visiting defence, although defender Chris Lawler had the measure of striker Harper. Although they had to ride an early storm from Hibs, Liverpool fought back and twice came close to opening the scoring as they demonstrated their ability to hit back on the break. Steve Heighway should have done better when played in by Edinburgh-born and former Hibs star Peter Cormack, before Ian Callaghan tested Hibs keeper Jim McArthur who was forced to beat away the midfielder’s strike. Just when Liverpool looked to be in the ascendancy they fell a goal behind thanks to Harper’s superb finish. The hard work was done by Scottish internationalist winger Arthur Duncan who strode clear down the left and drove to the byeline before cutting back for Harper to lash past keeper Ray Clemence from just inside the area. The goal in the 19th minute rocked Liverpool and they looked susceptible to greater damage with the Hibs midfield trio of Iain Munro, Alex Edwards and Stanton passing the ball around crisply in the centre of the park as they sought to increase their advantage. 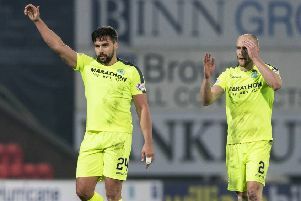 The Reds struggled to carve out anything noteworthy with the Hibs defence given an easy game of it when they must have expected a back-against-the-wall style job ahead of them before kick-off in what was one of Liverpool’s finest ever teams. When striker Ray Kennedy was presented with a chance on 57 minutes to level, he squandered the opportunity – his header from Heighway’s cross bouncing wide of McArthur’s left-hand post. Liverpool’s defence looked fragile mainly as a result of the tireless running displayed by Duncan and Harper, and they were exposed ten minutes from time when Duncan was brought down in the area by Lawler. A two-goal advantage would have left Hibs travelling south in confident mood, but Brownlie was denied by Clemence.